Naked-Stem Carpetweed is an annual herb up to 22 cm tall. Leaves are all at the base, 1.5-6.0 cm long, 6-16 mm broad, spoon-shaped to inverted-lanceshaped, hairless, narrowing into the stalk. Flowers are borne in dichasial cymes, leafless stem slender, hairless, involucral bracts ovate-oblong, 1-2 mm long, rough. Flower-stalks are up to 1.4 cm long. Sepals are oblong, 2.5-3.0 mm long, mucronate, imbricate persistent. Filaments are 1 mm long, persistent, anthers less than 1 mm long, sub-globose. Ovary sub-globose, 1.5 mm long. Stigmas 3, short, curved. Capsule as long as the sepals, sub-globose, dehiscing by 3 valves. Seeds less than 1 mm, muricate, minutely strophiolate, black and shiny. 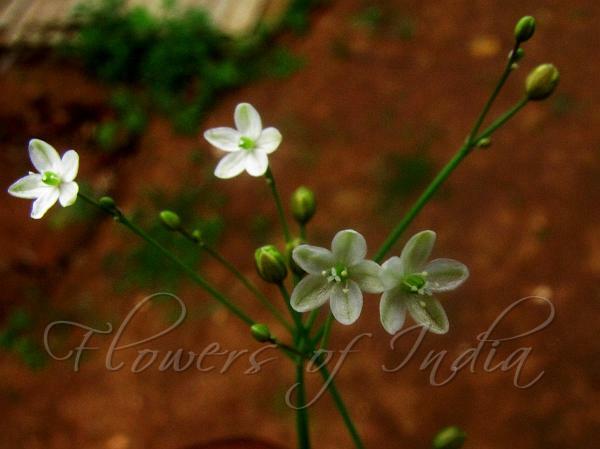 Naked-Stem Carpetweed is found on sandy seashores in India, Pakistan and Tropical Africa. Flowering: all year. Identification credit: M. Saradha Photographed in Coimbatore district, Tamilnadu.